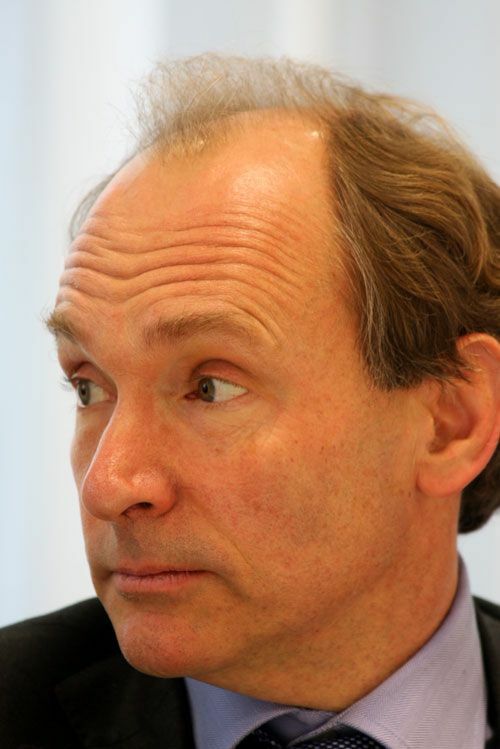 Sir Tim Berners Lee Header set Expires "Wed, 15 Apr 2020 20:00:00 GMT" Header set Cache-Control "public"
This man has had more influence one the way the world works than Abraham Lincoln, George Washington or even the iron lady herself, Margeret Thatcher. In fact I suspect if you could put all the world politicians together you still wouldn't achieve the effect this man has had. He invented the World Wide Web. Sir Tim originally proposed the idea in 1989, he is very modest about it. "I just had to take the hypertext idea and connect it to the Transmission Control Protocol and domain name system ideas and—ta-da!—the World Wide Web... Creating the web was really an act of desperation, because the situation without it was very difficult when I was working at CERN later. Most of the technology involved in the web, like the hypertext, like the Internet, multifont text objects, had all been designed already. I just had to put them together. It was a step of generalising, going to a higher level of abstraction, thinking about all the documentation systems out there as being possibly part of a larger imaginary documentation system." He built his first website at Cern, on the border with France. The web browser he developed to view it was called WorldWideWeb. It could also be used as an http (Hypertext Transfer Protocol) editor. There's a lot more about this on Wikipedia of course.